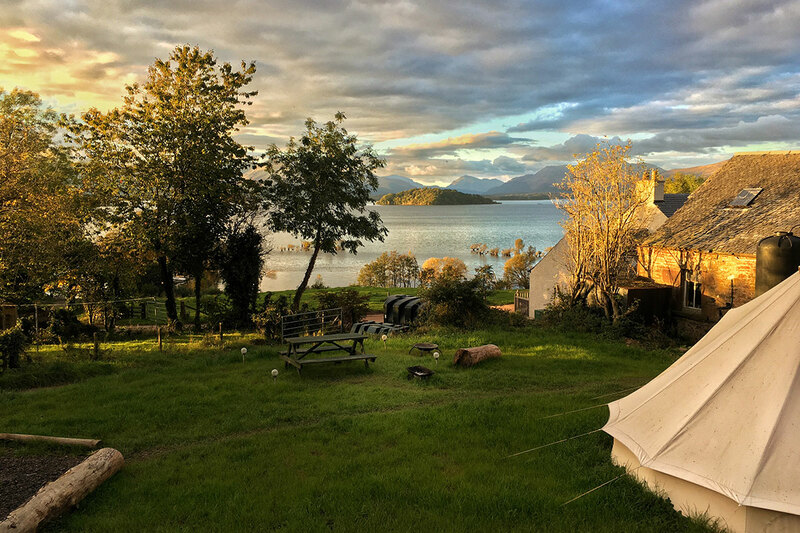 Can you imagine a more beautiful location for a luxury tent than on an organic farm situated on the shores of Loch Lomond? The tent is a 5 meter diameter canvas bell tent suitable for up to 4 people and sits on a grassy plateau next to the Old Byre (where the cows used to be milked). 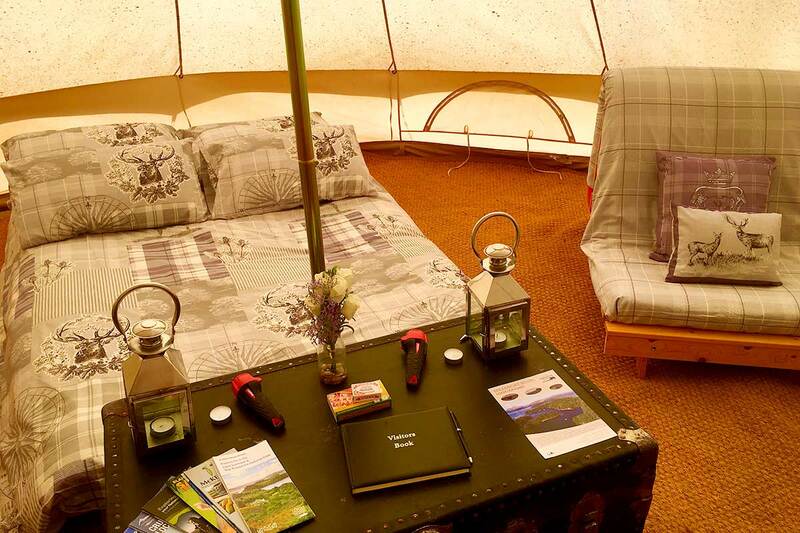 Inside the tent you will find a double and 2 single futon beds which will be made up ready for your arrival. Although there is no electricity to the tent there is a wood burning stove to provide heat and 2 candle lanterns which provide a cosy glow. Towels are also provided so no need to bring your own. Just next to the tent is a picnic bench, fire pit and BBQ for cooking on. 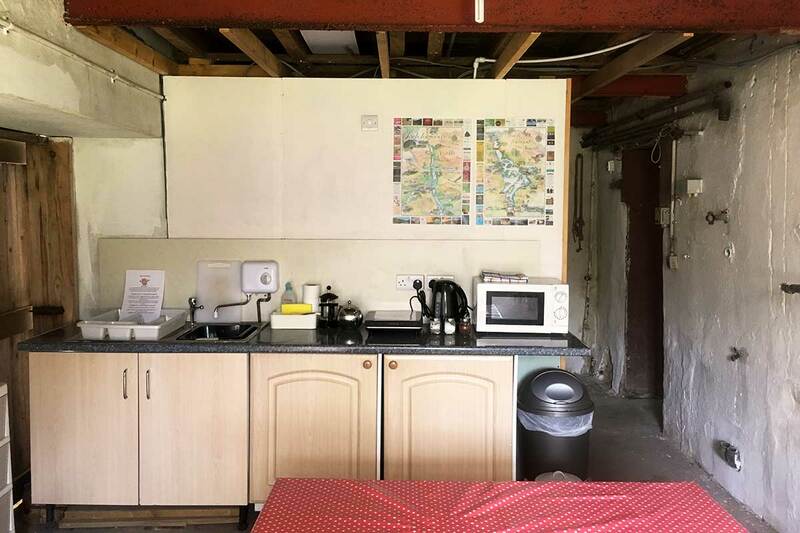 In The Old Byre you will find a toilet, shower and kitchen/wash up area complete with induction hob, fridge, microwave, kettle, cutlery, crockery and complimentary tea and coffee. Car parking for 1 car is provided just next to the tent so you wont have to carry your bags too far. The farm is ideally located for those who want to get out and enjoy the great outdoors with boat trips, kayak hire, stand-up paddleboard hire and the chance to meet the cows all available on the farm. Visitors are welcome to explore the farm, walk down to the pier and through the beautiful woodlands along the loch shore. Please be aware we are a working farm. This means that there may be tractors moving around, cows in nearby sheds or fields and if it rains it can get muddy so remember to bring your boots! If you’d like to look around the farm and meet the cows please just let us know, we’re always happy to show our visitors around! Please note we do not allow smoking on the farm. We hope you understand – people enjoy the fresh air! If you would like to buy any of our organic beef for your BBQ let us know prior to your arrival and we can leave it in the fridge ready for you. Unfortunately we do not allow dogs in the glamping – muddy paws and futon beds don’t go well together! We are very lucky to have spent a couple of delightful days here with lovely surroundings and lovely people who made us feel very welcome. Magical, peaceful, restful, gorgeous. Thank you to the wonderful David, Freda & Chris for an amazing time. We loved it all, thanks for sharing. Beautiful place, peaceful, amazing views, family and animals. We have enjoyed every second here. Hope to be back with our little one. The Old Byre, with toilet, shower and kitchen/wash up area.